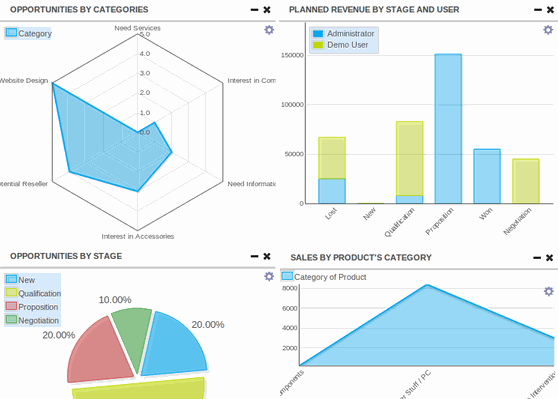 Manage your sales funnel with ease. Attract leads, follow-up on activities and meetings. Analyse the quality of your leads to make informed decisions and save time by integrating emails directly into the application. 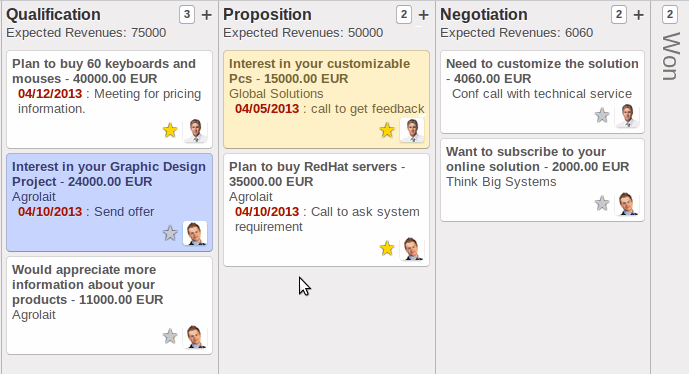 Track your opportunities pipeline with our revolutionary kanban view. Work inside your sales funnel and get instant visual information about next actions, new messages, top opportunities and expected revenues. Create leads automatically from incoming emails. Analyse lead efficiency and compare performance by campaigns, channels or sales team. Find duplicates, merge leads and assign them to the right salesperson in one operation. Spend less time on administration and more time on qualifying leads. Getting your sales opportunities organised helps you to stay focused on the best deals. 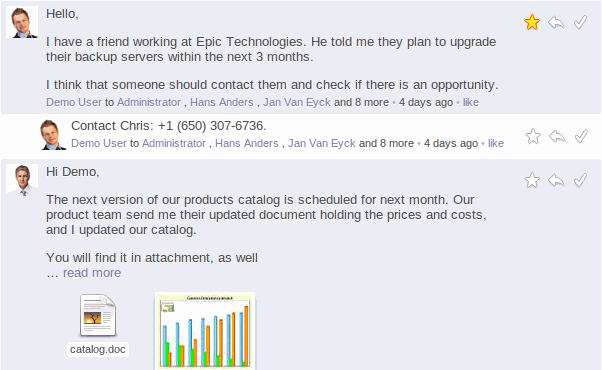 Manage all your customer interactions from the opportunity, such as emails, internal notes, meetings and quotations. Follow opportunities that interest you to get notified upon specific events: deal won or lost, stage changed, new customer demand, etc. Work with the email applications you already use every day. Whether your company uses Microsoft Outlook or Gmail, no one needs to change the way they work, so everyone stays productive. Route, sort and filter incoming emails automatically. 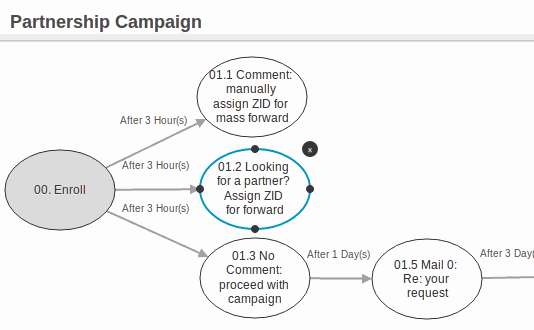 CRM handles incoming emails and routes them to the right opportunities or sales team. 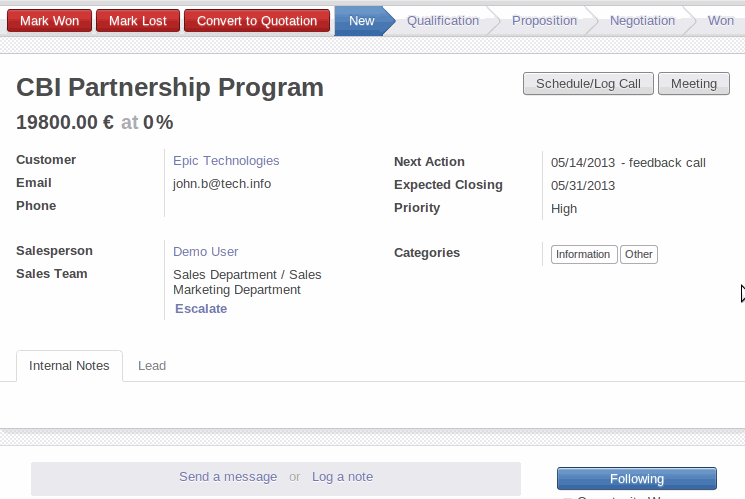 New leads are created on the fly and interested salespeople are notified automatically. Schedule your meetings using the integrated calendar. You can see your agenda and your colleagues' in one view. As a manager, it's easy to see what your team is busy with. Use our marketing campaigns to automate lead acquisition, follow ups and promotions. Define automated actions (e.g. ask a salesperson to call, send an email, ...) based on triggers (no activity since 20 days, answered a promotional email, etc.) Optimise campaigns from lead to close, on every channel. Make smarter decisions about where to invest and show the impact of your marketing activities on your company's bottom line.